The FSM-9 is a high performance fully calibrated 9-axis inertial measurement unit (IMU) / attitude heading reference system (AHRS). It includes a tri-axial accelerometer, a tri-axial gyroscope, a tri-axial magnetometer and a 32-bit MCU in a rugged enclosure. 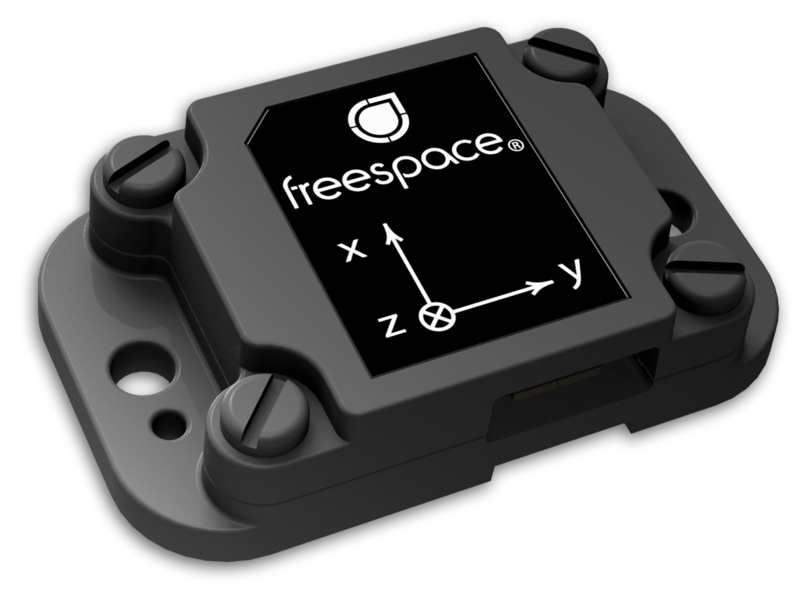 By fusing the output of these sensors with the onboard Freespace® MotionEngine™ software, the FSM-9 provides precise real-time 3D orientation, heading, calibrated acceleration and calibrated angular velocity, as well as more advanced outputs such as cursor. The 9-axis motion output is unmatched in performance at any price point and is ideal for use in HMDs, Virtual Reality systems, and a variety of other applications. The FSM-9 is a high performance fully calibrated 9-axis inertial measurement unit (IMU) / attitude heading reference system (AHRS). The FSM-9 combines industry leading hardware and software to output real-time 3D orientation, calibrated acceleration, calibrated angular position, and heading. It also offers more advanced outputs such as cursor position and gesture recognition all through a standard USB interface. Our FSM-9 modules are individually calibrated for inertial and magnetic errors to ensure high performance in all environmental conditions. Using Hillcrest’s unique sensor qualification lab sensors and modules are tested across over 50 variables including temperature, aging, and voltage to measure and correct for errors including bias, sensitivity and cross-axis alignment in real-time during use. In addition, dynamic magnetic tracking eliminates hard and soft iron interference. Drawing on Hillcrest’s long history of motion development, the FSM-9 leverages the elite performance of MotionEngine™ sensor fusion. Contact us for discounted volume pricing on orders of 10+ units. Advanced 9-Axis Motion - The FSM-9 combines industry leading hardware and software to output real-time 3D orientation, calibrated acceleration, calibrated angular position, and heading. It also offers more advanced outputs such as cursor position and gesture recognition all through a standard USB interface. Individually Factory Calibrated - Our FSM-9 modules are individually calibrated for inertial and magnetic errors to ensure high performance in all environmental conditions. Using Hillcrest’s unique sensor qualification lab sensors and modules are tested across over 50 variables including temperature, aging, and voltage to measure and correct for errors including bias, sensitivity and cross-axis alignment in real-time during use. In addition, dynamic magnetic tracking eliminates hard and soft iron interference. Industry Leading Sensor Fusion - Drawing on Hillcrest’s long history of motion development, the FSM-9 leverages the elite performance of MotionEngine™ sensor fusion.